This is a view from the hills behind Laphroaig, taken during the Islay walking week in April this year. You can't really see the distillery from here, as it is pretty much hidden by the trees. You get a good view of the newer warehouses along the A846 though. 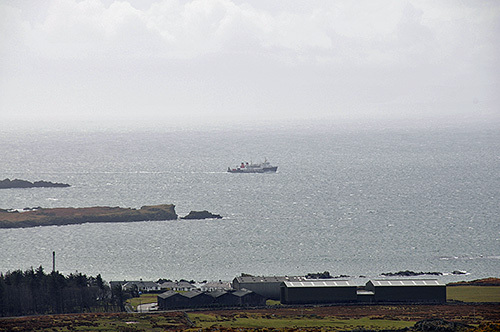 The ferry passing in the background is the MV Hebridean Isles on her way to Port Ellen. If you're on Islay (or on the way to Islay) have a great Feis Ile, if you're elsewhere have a great weekend!